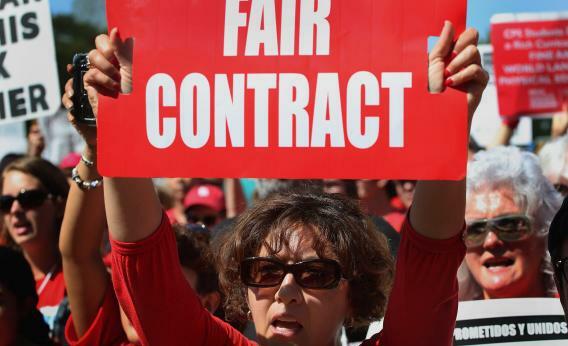 Chicago teachers strike: Maintaining job security is a core goal of labor unions. CHICAGO, IL - SEPTEMBER 15: Striking Chicago teachers and their supporters attend a rally at Union Park September 15, 2012 in Chicago, Illinois. I think this is 180 degrees backward. The controversy about what is and isn’t an appropriate metric by which to assess a teacher’s performance is obviously a very important one. But the idea that labor union objections to firing their members are fundamentally about evaluation metrics is extraordinarily naive. Under any possible evaluation scheme—whether for teachers, journalists, auto workers, basketball players, truck drivers, or what have you—the union is going to want to make it as difficult as possible to fire people. The idea of a labor union is to, among other things, represent the workforce’s interests and give voice to its desires. And in my experience people don’t want to get fired! In any kind of unionized workplace you see management pushing for more flexibility (i.e., ability to fire people) and the union pushing for more job securitiy (i.e., it’s easier to keep your job even if management decides you’re bad at it). Indeed, back during the Great Workplace Coercion controversy this was cited as a core advantage of more widespread labor unions—they make it easier for you to keep your job in a situation when the boss might otherwise fire you. Which is all just to say that in Chicago and elsewhere both issues are genuinely in play. There’s the question of what constitutes poor performance. But there’s also the general question of job security. One topic being debated, for example, is the question of “recall” of laid off teachers. If you lose your job in a layoff should you automatically go to the front of the line next time there’s a job opening, or should management have the right to hire whoever they want? It’s obvious why incumbents would like that kind of rule, and “last in, first out” policies in general. But that all just speaks to the general point that people don’t want to lose their jobs, and one of the most valuable services a union can provide to them is to make it difficult for them to do so. The upshot is that while obviously nobody’s going to say “I think it should be impossible to fire bad teachers,” in almost any context a union is going to want to define the set of workers whose performance is deemed unacceptably subpar as narrowly as possible. That’s what the union is for.